They look good, they taste good and they’re healthy! These savory fruits are good for you in ways you can’t imagine! If you don’t want to eat it, you can just apply it on your hair or face in the right way and see the magic happen. However, by eating avocados, you can actually reap more benefits for your health. • Diabetes Whether you have diabetes or you don’t, avocados help with either of the cases. Eating a meal rich in avocados prevents the sugar level from shooting up after a meal. The unsaturated fats in the body results in improving insulin function thereby help control your blood glucose level. • Heart Health Avocados help improving your heart health because it is not only the source of high mono saturated fats, but it is also rich in fiber that strengthens blood vessels and reduces blood cholesterol levels. The mono saturated fats protect the heart from oxidation that normally causes severe damages. • Arthritis Arthritis is a common problem that leads to the deterioration of bone and cartilages. Avocados help with symptoms of arthritis because it contains anti-inflammatory mono saturated fats. • Weight Loss If you’re trying to lose weight, then avocados is the fruit for you! The mono saturated fats allow normal body fats to be burned at a faster rate. Mind you, they don’t cause weight loss, they just act as a mediator for it. • Vision It provides vitamins and protects your eyes from cataracts and other damages caused by anti-oxidation. Amongst other things, it also protects the eyes from UV radiations of the sun. 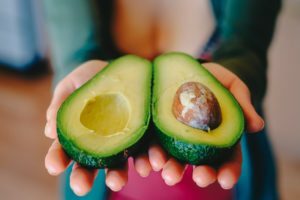 There are plenty of other ways that avocados help keeping the body healthy whether you choose to eat it, drink it or even apply it over your face. It’s up to you, however, how you prefer to make use of it.